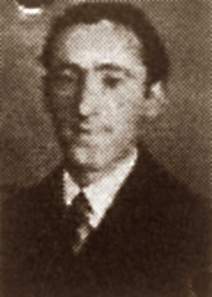 Izak Aufseher was born in the small town of Kuty in Galicia, then part of the Austro-Hungarian Empire, and now in the Ukraine, into a poor Jewish family on the 26th January 1905. He only attended school, run by Hasidic Jews, for two years and with the outbreak of the First World War he saw the break-up of his family. Forced by poverty to emigrate, he ended up in Berlin in 1928. There he joined the Leninbund, a left split from the German Communist Party(KPD). With the Nazi rise to power, Izak again emigrated, this time to Paris and then on to Barcelona, where with his companion Margot Tiertz he ran a bookstall on the Ramblas. He distributed antifascist and anarchist literature from the stall. At the beginning of 1935 his stall was shut down by the authorities and he was expelled from Spain with Margot after pressure from the German embassy. He returned to Barcelona at the beginning of 1936 but was arrested and jailed in the Modelo prison from where he was freed just a few days before the Nationalist uprising. He now joined the German Anarcho-Syndicalists (DAS).He became the secretary of the International Committee of Anti-Fascist Migrants (CIDEA) founded in August 1936, mainly through the efforts of the DAS, which took over several buildings requisitioned from German Nazis in Barcelona, including a chalet owned by a German Catholic religious order of Saint Teresa of Avila, the Theresienheim, linked to the Nazis. Serving on the committee with him were Ernst Appel and Arthur Lewin for the DAS, as well as two delegates from the KPD and two from the German volunteers with the POUM. Izak spoke excellent Spanish and was able to help some Jews flee to Palestine and others gain Spanish nationality, raising funds from his contacts with Jewish organisations. He was also involved in the requisition of German Nazi property and funds at Barcelona and in employment programmes through the setting up of collectives for German migrants. Izak often came up against Communist Party members with his denunciations of Stalinist manoeuvres within the CIDEA, but somehow he escaped arrest when other DAS members were arrested after the May Days of 1937. However he was eventually arrested and imprisoned in the Modelo again. He somehow obtained a transit visa for Poland from the French Consulate. He left Spain on 17th July 1937 with his new companion, the British journalist Emmy Wiechelt-Scholem and went to Paris where they lived underground until March 1939. From there he escaped to Switzerland. There at Basle he was involved with the setting up of a Swiss anarchist group along with the Noechlin brothers, Felix and Heinrich. This was one of the few anarchist groups active in Switzerland during the War. He had to work clandestinely as he did not obtain a work permit until 1945, again selling second-hand books. The group published a magazine Blätter für Freiheitlichen Sozialismus between 1944 and 1946 and produced a duplicated pamphlet in 1945, calling for a new revolutionary workers movement,which was distributed in Germany. The group became known as the Association of Libertarian Socialists (Freiheitliche Socialisten).The group produced ten issues of Der Freiheitliche Sozialist, printed in Paris by the Noechlin brothers. Izak was active in this group between 1947 and 1949.The group also put on meetings with speakers from the Spanish anarchist exile movement and established links with surviving German anarchists like Otto Reimers. Izak became involved in the housing cooperative moment. He married in Basle. He never obtained Swiss nationality and died on 23rd May 1977, an anarchist to the end.